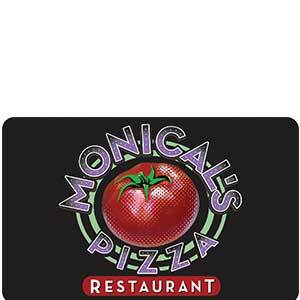 Monical’s Pizza® participates in a gift card fund raising program. This program, often referred to as “shopping cart fundraising” or “SCRIP”, allows non-profit organizations to raise money with a minimum amount of effort. Schools, churches or other non-profit organizations can pre-purchase gift cards at a 5% discounted rate and then re-sell the Monical’s Pizza® Gift Cards at full face value. Example: a non-profit group purchases a $100 set of gift cards for $95, and “sells” them to the program participants for $100, making the $5 as fundraising “profit”. What makes this program valuable? This effective fundraising tool works for organizations because your members use it to buy one of their favorite products – pizza – while generating a portion of funds for your cause, projects, or programs. The Monical’s Pizza® SCRIP program may be used in conjunction with the Community Day Fundraising Program to increase your organization’s fundraising efforts. * Please allow 14 business days to process a new application prior to placing an initial order.